Artistic view of a 43T rigid truck concept. 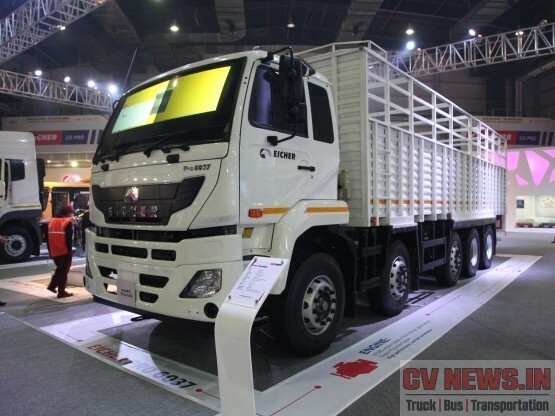 Indian truck market is undergoing a transformation in last couple of years. Thanks to new entrants like BharatBenz and a swift response from incumbents like Ashok Leyland, Tata motors and Eicher. There is a definitely a greater level of change that’s is happening in every aggregates in trucks. Engines are now more frugal yet produce more power, trucks are now more costlier yet has lower operating cost. Though India is still far from western countries in terms of market and product requirements, Indian trucks are definitively changing. Though part of improvements are due to competition between manufacturers, there are certain changes that are necessitated by regulations like GST. As we have estimated, there could be a possible way in which the truck segments can be consolidated in a way to facilitate hub and spoke model. This means, the growth for the trucks could be towards 40T trucks and beyond and 16T trucks and below. Currently in between these two segments, we have 25T, 31T and 37T truck segments. When the economy was just booming during 2010, there were requirements for higher tonnage rigid trucks beyond 31T cropped up. As higher the tonnage carried, lesser the cost of transportation. Then why not a tractor instead of a rigid truck? Tractor’s are a speciality vehicles and require skill for driving, they attract higher toll taxes, higher insurance premiums and have huge limitations in operating within city limits. 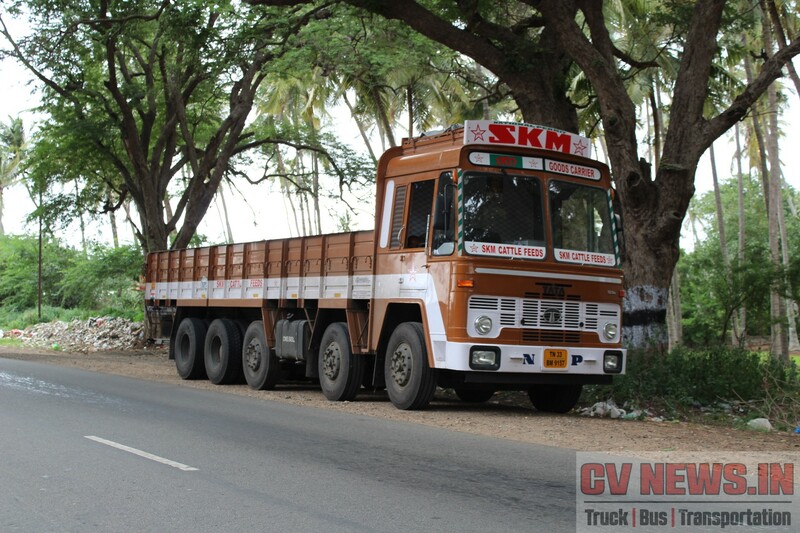 Hence the need for a 37T rigid truck and subsequently in 2012, these trucks were launched by Ashok Leyland, Tata and AMW. Though the trucks were launched, there were no benchmark for the performance of trucks as the segment was new. So there were lot of new trails and obviously with many errors as well. There was debate on to have a 10×2 or 10×4, then where to place the 6T axle whether as a pusher or as tag axle, and how will the manoeuvrability for driver be, as TCD – Turning Circle Diameter will be over 23M. Also this was the first rigid truck segment to have 9 speed gear box. Finally though Ashok Leyland showcased 3723 with 230hp engine, Ashok Leyland launched only 3718 10×2 variant with pusher lift axle, unlike Tata which launched a 3723 10×4 with tag axle and subsequently a 3718 10×2 with tag axle and finally with 3718 10×2 pusher lift axle. Soon after the segment started to witness traction, BharatBenz, Eicher, Mahindra did launch products. The current total industry volume is estimated at around 19,000 trucks and is likely to grow in coming years as well. Fly ash carriers, Petroleum and oil tankers, Cement, Steel and Iron carriers, reefer van are few of the major applications to which these trucks are catering to. The segment is growing and has received a positive response from various stake holders. The underlining fact for the success of 10X2(4) 37T trucks is, this is a compact truck, yet it can carry upto 25T payload. So continuing its success, the extension of this product could be a 12X2(4) 43T rigid truck. By adding one more 6T tag axle in rear over hang, the truck capacity can be increased to 43T. The concept is too early to get into production, but still could be a viable product, if developed with a strong understanding of the Customers and product requirement. This segment with all the advantages of 37T truck will have an advantage of having additional payload of ~5T, taking the overall payload to over 30T. Primary challenge will be higher turning circle diameter which should be ~25M. Higher load carried in a rigid truck means, increased chances of frame failures and hence may require higher section modulus frame. Challenge in packaging of spare wheel, tanker discharge units. Just in case spare wheel is moved from rear over hang to front, will have difficulty in positioning tanker discharge units. 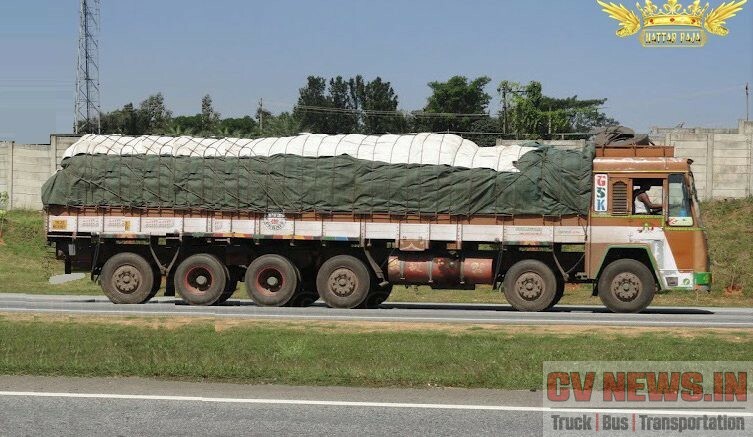 Its common to have additional fuel tanks just to fill diesel in the home town, and this truck will virtually not have space for mounting additional fuel tanks. Gradeability, fuel performance and tyre mileage will be a challenge in terms of performance characteristics. 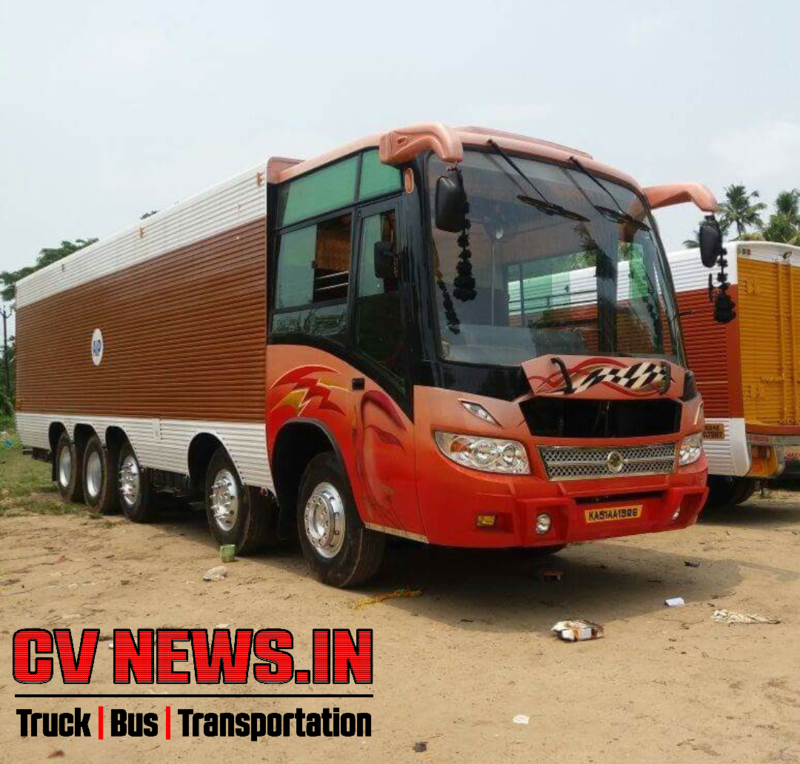 Going forward, new concepts are a welcome move and Indian truck market is sizeable enough to accommodate this kind of concepts. But even before completely moving towards a 12×2 truck, existing 10×2 with a 6T, pusher axle can be replaced by a 10T twin tyre lift axle, which can increase the GVW to 40T. So there are enough options and its upto manufacturer’s to choose the right axle configuration considering Indian market requirements. Below are some of rigid truck concepts developed for certain speciality applications. Some of them are one of its kind and some are limited to certain applications like truck mounted cranes, concrete pumps etc. 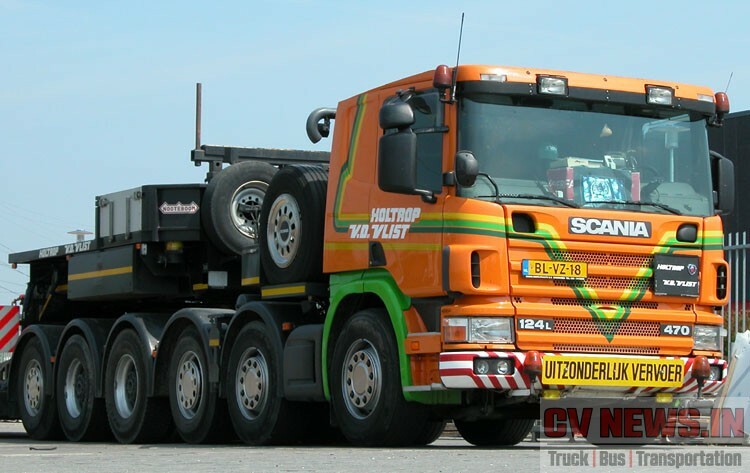 This 6-axle Scania P124G-470 belongs to Holtrop from Assen, Netherland. The truck is a rebuilt of a 8×4 to a 12×4. This is basically a tractor and is used for transport of heavy undivisible goods without the need of having a dolly between the lowloader and the tractor. Fuel tank is fitted over the chassis and is behind the cab. The 12 liter Scania engine with 470hp, normally cannot be combined with the P-cab, but chosen for this application. To get the desired cooling capacity for this engine, a additional radiator has been installed. This cab is low enough to lay booms of machines over the roof. Terberg Techiek is a specialized in truck modification, mining vehicles, drive shafts, container systems and provides repairs and servicing company based out of Netherlands. The original 10×4 truck with a technical GVW of 56 tonnes is now a 12×4 with a GVW of 64 tonnes. Terberg and Volvo Trucks Nederland together arranged the individual vehicle approval. This is a modified The crane boom extends to almost 60 metres and its maximum lifting capacity is 125 tonnes. In collaboration with BAS Mining Trucks, Terberg Techniek modified a 750 bhp Euro 6 Volvo FH16 into a 12×6 configuration. This truck is designed for mining in which large mass has to be moved over a greater distance. With axle loads of 2×12 and 4×20 tons, makes it a GVW of 104 tons. AJK provided the truck with a 37.5 m3 tipper, good for a payload of 75 tons. The 15.5-metre chassis, with a 620 hp V8-engine, is probably the longest ever built by Scania. 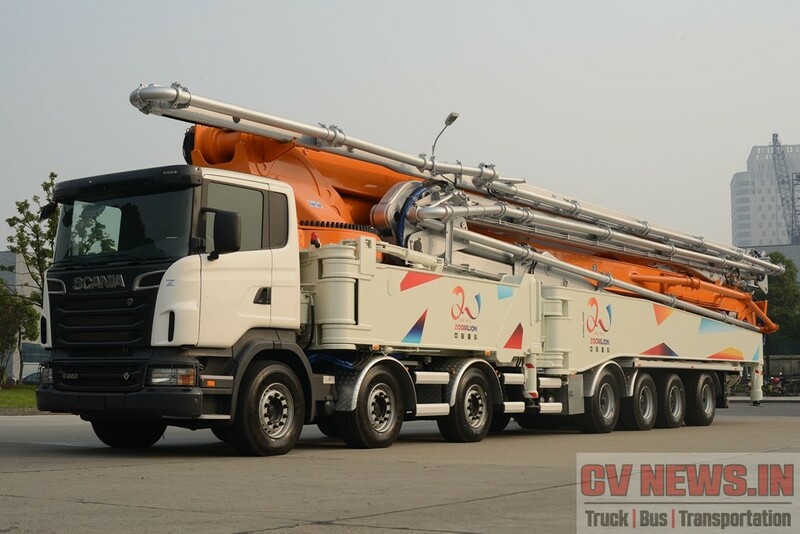 The complicated concrete pump superstructure was developed by Zoomlion and Italian construction equipment maker Cifa, a subsidiary of the Chinese giant, and built at Zoomlion’s main facility in Changsha in central China. Altogether this very special vehicle is 18.5 metres long. 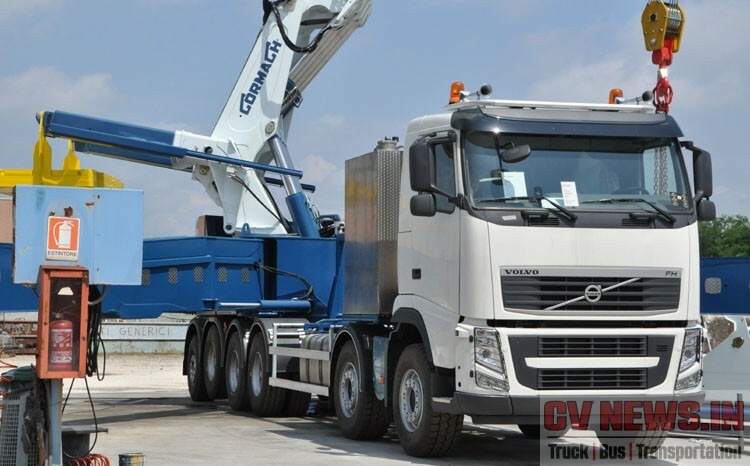 An exceptional feature is the fact that the pump structure is mounted on a “normal” truck chassis, not on a special vehicle, which means that it complies with the maximum dimensions and footprints imposed for road transport. “Officially amazing” is the slogan of Guinness World Records, the company behind the world’s best-selling copyrighted book, that awarded the honour for this amazing Zoomlion-Cifa-Scania vehicle. 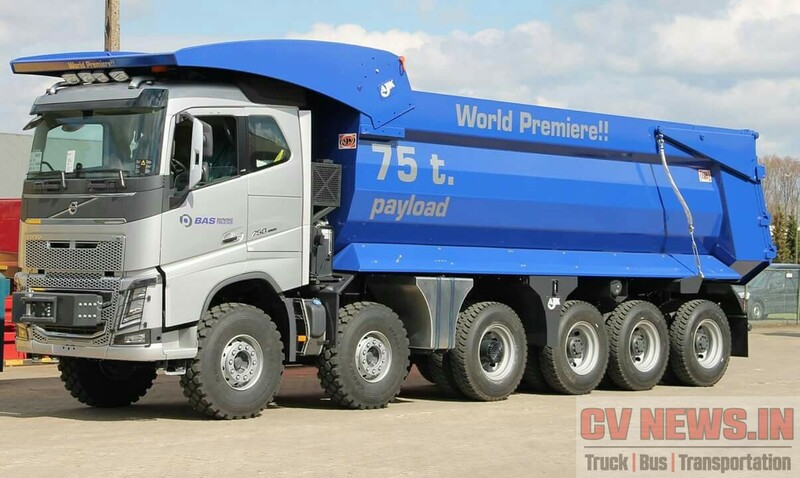 Again modified by Terberg Techniek, the base truck is a Volvo FH460 8×4 modified to a 12×4 configuration. Terberg installed 2 extra axles at the rear. This axle has hydraulic suspension and hydraulic steering (the whole axle is moved by 2 cylinders). Behind this 16 ton (technical weight) axle they installed a 10 ton tag-axle with a 4 point air-suspension that has a electric-hydraulic steering system. Total load carrying capacity is 63T. 1 Comment on "What next to 37T rigid trucks? Here is a concept of 43T rigid truck." Firstly, considering any MAV, whether x4 or x2 is purely based on application. For those trucks that ply on road x2 will do. For tippers that mostly ply off roads x4 is must. However for application such as cement bulker, its a big confusion. The construction site bulker trucks enter into usually have muddy (kuccha) roads, very often I have seen AL3718 getting stuck with spinning wheel and an Excavator / Backhoe loader working hard to get it out of the ditch. Whereas TML understood this roblem and introduced 10×4 for 37T, however fleet owners did not like to compromise mileage on x4 and thus switched to x2, later Tata had to follow the trend. The need of the hour is a simple switch (similar to differential lock) which disconnects second rear axle and makes it a x2 while plying on roads, and when the truck goes off road, activating the switch should make it x4, will any OEM take it up..? ?